The brewer nominated former Altria CEO Martin Barrington as chairman. Though he’s not linked to the Brazilian investment firm that jointly controls the $143 bln company, the Marlboro maker is a shareholder. Investors who want a more radical shake-up have an opportunity to say no. Chair Olivier Goudet is leaving the brewer because of conflicts with his role at JAB. Both groups share a taste for buying assets, and cutting costs. Yet the tension with JAB’s Snapple or Dr Pepper brands shows the strategy’s limits, and AB InBev’s need to go beyond alcohol. The Belgian brewer is said to be mulling an IPO of its Asian unit. The region is a fast-growing jewel in the drinks giant’s crown, yet it faces stiff competition in China, and still struggles in India and Southeast Asia. The mooted $70 bln valuation will be tough to keep down. The death of Belgium’s richest man casts a spotlight on GBL, the 13 bln euro group he co-founded. Despite past canny investments, it’s valued at a hefty discount to stakes in companies like Adidas and Pernod Ricard. Selling assets and beefing up private deals could change that. The Bud owner halved its dividend to pay down a debt mountain from buying SABMiller. This should free up $4 bln annually, but it could take eight years to hit its leverage targets. Any more trouble in emerging markets will mean an even longer wait for clear heads. Alliances to pool purchases, like one signed by Carrefour and Tesco, have in the past boosted grocers’ operating margin by up to 1.5 percentage points. Wringing savings without all the hassle of a merger is great. It does less to stop Aldi and Lidl grabbing market share. The luxury brand’s top investor, a vehicle of Albert Frere, has sold its 6.6 pct stake. It’s an odd move for the typically long-term owner. But Burberry’s valuation rivals peers like LVMH, and boss Marco Gobbetti’s turnaround will be a lengthy process. It’s a good time to exit. The world’s top brewer served up better-than-expected EBITDA in the fourth quarter and a welcome chaser of volume growth. That will soothe investor worries that ruthless cost cuts are hurting sales. Now it needs to reverse falling market share in its most important U.S. market. 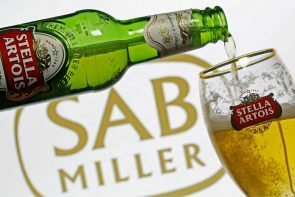 A year after acquiring SABMiller, the world’s No.1 brewer said cost savings from the deal will be higher than expected. Bulking up allows the Belgian company to buy on better terms. Yet it looks worryingly weak at persuading consumers to drink more of its beer. Brussels has invited member states to bid to host the European Banking Authority when its current host, Britain, quits the EU. The EBA hasn’t exactly dazzled in its handling of bank stress tests. But it could be a decent trophy for a non-euro country that feels unloved by the bloc. The insurance marketplace is creating a new company in Brussels. Yet safeguarding access to European clients only means moving a maximum of a tenth of staff. Companies are readying their parachutes, but this is a long way from threatening the city’s pre-eminence. The mega-brewer expects savings from its SABMiller tie-up to reach $2.8 billion, 14 percent more than its initial estimate. Yet the upgrade is significantly smaller than it managed with previous deals. Taking on ever-bigger targets is testing its knack for squeezing expenses. You demonstrated a varied, voracious appetite for insight in 2016. The most-clicked columns, podcasts and graphics encompassed the rise of Trump and Brexit Britain to Singapore, Saudi Arabia, negative rates, tech titans and an ethical dilemma for Harvard's business school dean. The Japanese brewer is paying 7.3 billion euros for AB InBev’s eastern European beer brands. At 15 times trailing EBITDA, the valuation is close to what it paid for Grolsch and Peroni in February. That’s an exuberant price for so-so brands in a difficult region for brewers. Belgium's Bpost has made a final offer of 2.5 billion euros for Dutch rival PostNL. The deal is a play for the fast-growing parcel business. With the target's shares trading below the offer, Dutch government opposition may scupper delivery of a good deal for investors. The tiny Belgian region is holding up a trade pact between Europe and Canada. That doesn’t mean such deals are impossible, though - they just need even more time and creative thinking. The messy process also undermines the notion that ordinary people have no say in globalisation. In most sectors, a heavily loss-making company with liabilities that exceed its assets would disappear. Yet German carrier Air Berlin is still airborne, and Lufthansa may take on a chunk of its fleet. Aviation bosses continue to think they can defy financial gravity.